Abigail Kamleiter, CAWA, has led the No Kill South Carolina initiative at Charleston Animal Society in 2016. 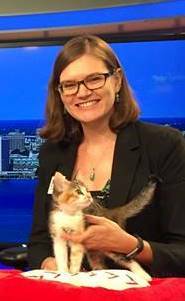 Previously she spent 10 years in senior management at the Humane Society of Pinellas in Clearwater, FL, including 6 years as Director of Operations and 3 years as special projects manager. She led the shelter’s participation in the ASPCA Rachael Ray $100K Challenge, started a pet retention referral program, developed wellness and mobile spay-neuter clinics, and more. She was a founding board member of MEOW Now, a nonprofit aimed at bringing TNVR to Pinellas County; this involved working with county officials to amend local ordinances in addition to building the organization itself. Abigail has experience as a humane law enforcement officer and ACO and has taught emergency animal sheltering to disaster volunteers. Additionally, she is a Certified Animal Welfare Administrator and has studied nonprofit business management at the graduate level.